These beautifully made binding posts are fashioned from pure Tellurium-Copper alloy. The Gold/Rhodium model has a jewelry-like appearance. Either version achieves a notable sonic improvement. The 'nut' part can be 'backed off' and completely removed so you can easily get two or more spade lugs mounted on the post or even "ring" lugs will slide onto the posts. The hole in the ends accommodate any 'Banana' plug. Don't be confused a "pair" is enough to do one stereo amp. If you have access to an appropriately sized step drill and a fairly stout electric drill that would be the preferred tool to enlarge the original hole. If it already has a 1/2” D-shape hole, file out the flat side with a round section file or make the Cardas insulator a "D" shape. These solid metal connectors require a good deal of heat for a successful solder joint. You should use a higher wattage soldering iron than the small one you use on a circuit board. The capabilities of small irons can vary a lot so you be the judge. You want to apply heat for a relatively small amount of time to prevent melting of the plastic mounting plates. If you have a tin of rosin type electrical solder paste smear some around the connector "hole", 30 minutes in advance or over night, to ease the soldering operation. If you have a wire brush bit for your Dremel tool you can “clean up” the soldering area. A small manual brass brush works too. Brushing may not not be desirable on the gold/rhodium version. Always remove the "nut part" when soldering so that it will not absorb additional heat from your soldering iron. Advice for installers: These binding posts require two 1/2" dia. mounting holes on 3/4" centers. Original mounting holes in the chassis of Hafler DH-200/220 and Hafler XL-280 are on 3/4" centers, but the holes must be enlarged. The DH-500 and XL-600 have "D" shaped holes of the correct diameter and you merely modify them to a round hole or the mounting plate to a "D" shape. Important Note: If the original holes in your chassis are less than 1/2" and you decide to skip enlarging the hole to save time and effort, just because the 'bolt' part of the posts fits thru the hole in the chassis, beware. If your new binding posts form a 'short-circuit' to ground, you amplifier may be destroyed when you first turn on your modified amp. At the very least, it will not work correctly under short-circuit conditions. Do it right! You guessed it, I mention that because I’ve seen that on our repair bench before. *Typical pricing for many amplifiers, more difficult installations may incur higher cost. Advice for installers: These require a minimum 1/2"(0.500") mounting hole (if using the insulators) - 0.550" hole is fine. Smaller holes can be easily enlarged with a round section metal file or step drill. Some existing holes are a “D” shape and just need rounding out. If you have one and are experienced with it, a Dremel® Moto-Tool works great here. A ceramic tile cutting bit is great for this chore, but they are made from brittle Tungsten-Carbide and can be easily broken when you are reaming metal. The Dremel Tool can be a great help, but requires some skill. You can do disturbing damage to your chassis in an instant, so practice on a piece of scrap metal, if you buy one of these very useful tools. ALWAYS wear eye protection goggles when using any power tool! Remember how "MOM" said, you only get two eyes! Standard Binding Posts - You know the Red/Black captive pair with Gold-Plating. You’ve seen too many to warrant a photo. Ours are much the same but a whole lot better than the standard Hafler or some other stock binding posts. - $69/installed on most amps, $14.95 plus shipping for parts only - difficult installations might add extra cost. Short RCA Female, non-magnetic, eutectic Brass, Rhodium over Silver plate. 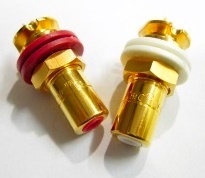 Comes standard with thin (.0135"), gold plated hex nut, Teflon insulation. Supplied with red & white washers for channel identification. These beautiful CMC RCA input connectors are the fine sounding Gold RCA jacks with a jewelry-quality appearance. High quality brass housing. The fastening nut is installed from outside of the chassis. Color-coded plastic insulating washers and mounting hardware are included. *Typical pricing for many amplifiers/preamplifiers, more difficult installations may incur higher cost. Critically Important Fact!!! : Remember that your original RCA jacks may be insulated from the chassis or actually 'hard-grounded' to the metal without insulating hardware. When you install new jacks always observe this important fact. Some equipment may 'make' an important circuit ground via the RCA jack shield ground shell. The equipment may function improperly if new RCA jacks are not installed in the same electrical manner as the originals. Paying close attention, before smelling smoke, is always the best policy!!!! Advice for installers: These require a larger than stock mounting hole in most cases (especially if using the insulators). Smaller original holes can be enlarged with a round section metal file - a bit tedious -, a reamer or a step-drill with some caution. ALWAYS wear eye protecting goggles when using any power tool! Freedom! That’s one advantage to an IEC socket. If you don’t recall the term, this is the AC power socket that you know from the back of your computer. The removable power cord is a great convenience when moving the product and it allows one to try out different power cords to see how they might affect the sound of your system. Unless you already have an IEC socket and are just installing our socket(s) you will have to cut out a hole to fit the socket - no fun I might add. If you decide to install it yourself you might use a power drill to ‘outline’ the hole and trim the rest with a dremel tool with the ceramic tile bit. It’s a tricky process and it is easy to break those rather pricey bits. Always protect your eyes! Standard IEC socket: These are usually black plastic with plated copper or brass contact pins. Here in the USA they are typically rated at 120VAC and 15 Amps continuous current. IEC-320 C14 is the type encountered in North America. $100/installed for many devices, difficult installations may be more. Kit(Connector, Hardware[2 screws, 2 nuts], 3 Fast-Ons, Solder) - $15.95 Recommended tool: crimp tool or soldering iron Cords available below. Rhodium IEC Socket: The model we deploy has copper pins/lugs with Rhodium plating. If you buy as a kit you would get stainless steel mounting screws and silver-plated fast-on style connectors for connection wires though you might prefer to solder. $125/installed, difficult installations may be more. Kit(Connector, Hardware[2 screws, 2 nuts, 3 Fast-Ons], Solder) - $24.95 Recommended tool: crimp tool or soldering iron Cords available below. Too new for picture: Beautiful chocolate brown IEC socket with Pure Polished Copper Contacts. It has screw mount connectors so it is solder-less $139/installed for many devices, difficult installations may be more. Kit(Connector, Hardware[2 screws, 2 nuts]) - $29.95 Recommended tool: crimp tool or soldering iron Cords available below. A NEMA 5-15P to IEC-320 C13 style power cord can be supplied with these socket. We use a good quality import cord but nothing fancy. There is a wide variety out there so we prefer you make that choice if you want a “high performance” cord. If you already have a good quality cord then keep it.